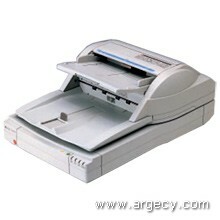 IS450SE Image Scanner 65 ppm, Simplex, 11" x 17". The RICOH IS450 Image Scanner offers several exciting innovations that have been designed to improve your work efficiency. To start, it is able to perform duplex scanning at the swift speed of simplex mode scanning at 65ppm. You can operate it independently of your PC. It comes standard with an Endorser function. The Ricoh IS450s intelligent design allows you to place it virtually anywhere with easy access to all of its many features. The IS450 handles the broadest range of paper sizes - up to 11" x 17", and it is the first scanner to pass the US EPAs rigorous Energy Star specification standards. Add a full roster of image processing features, and you have a scanner that will keep you far ahead of your burgeoning scanning needs -- with style. The Ricoh IS450s impressive scanning speeds of 65ppm in simplex mode and 98ipm in duplex mode ensure enhanced work efficiency. The Endorser enables you to print up to 19 characters for easy retrieval of mission critical images. The Ricoh IS450 comes standard with SCSI-2 (SCAM) interface and ISIS and TWAIN complaint software drivers. This function automatically detects the length and width of the original and sends the information to your PC screen. The ADF can handle up to 150 standard letter size sheets at a time. The Ricoh IS450 Image Scanner is capable of handling a wide range of sizes, from small documents such as personal checks to 11" x 17" paper with impressive reliability. Unlike conventional scanners that can only be operated via PC, with the Ricoh IS450 Image Scanner you can activate the scanner by pressing the Start Key on the scanner unit operation panel (Manual Scanning). The Ricoh IS450 Image Scanner intelligently integrates paper feeding and other operations for maximum flexibility, enabling convenient placement against a wall. All cables, cords and connectors are recessed so the ADF can be opened without having to relocate the scanner. The Ricoh IS450 is the first scanner to meet the specification standards of the US Environmental Protection Agency's Energy Star program. A maximum of 256 gradations of gray scale are available to permit highly accurate scanning of photographs. DOCUMENTS - Accepts reflective documents (books, flat sheets) up to 11" x 17". Accepts up to 150 sheets (8.5" x 11" size paper) Max. 11.73" document, Min. 2.7"
DIMENSIONS - 18.5"w x 11.22"h x 26.77"d WT.- 57 lbs.